It takes a brave man to star in an arm-wrestling movie after the face-plant that was Over the Top. Ladies and gentlemen, that man is Don Lee (Ma Dong-seok). He is the one who brawled his way through a train car of zombies in Train to Busan. Believe it or not, his character even references the notorious Sylvester Stallone bomb as his inspiration. Yet, Lee manages to surpass his role model in Kim Yong-wan’s unabashedly earnest family sports drama Champion which player earlier today at Fantasia. “Mark” Baek Seung-min is big, but shy. He had a hard time of things during his formative years, so it is understandable. His desperately poor Korean mother gave him up for adoption, but his American foster parents died shortly after his arrival in the States, leaving him essentially on his own. Inspired by Over the Top, arm-wrestling became his only passion, but his professional career was cut short in America by a dubious scandal. His only friend, the sleazy (but possibly decent way deep down) Jin-ki has lured him back to Korea with the promise of managing his professional comeback. To sweeten the deal, Jin-ki also offers up the address of Baek’s birth-mother, but the arm-wrestler soon learns she has recently passed away from cancer. However, he discovers he has a sister (Su-jin), a niece, and a nephew he never knew of. Suddenly, they have someone to chase away the mobbed-up bill collectors and fix things around the apartment, while Baek finally starts to feel a sense of belonging. Of course, his refusal to throw matches at the behest of a crooked sponsor will probably lead to trouble down the line, especially when the scummy sports bettors recruit Punch, a steroid-juicing, psychotic former contender to be their standard bearer, straight out of prison. Lee, who was born in Korea, but grew up in America, graduating from Columbia State University, clearly understands where his character is coming from. He is acutely earnest as Baek, but he also looks like he could rip Stallone’s arm off. It is easy to see why he has already reached a significant level of stardom in Korea and is poised to do the same internationally when you see him interacting with Ok Ye-rin and Choi Seung-hoon, the young, ridiculously cute thesps playing his niece and nephew. The fact that he is not dramatically up-staged by them, pretty much says it all. Lee also shares some nice chemistry with Han Ye-ri’s Su-jin and turns some rewarding third act scenes with Kwon Yool’s heretofore annoying Jin-ki. Unfortunately, Yang Hyun-min and Lee Kyoo-ho make rather generic villains, who really are not very enterprising. Plus, Kim’s screenplay manufactures a lot of bogus drama that starts to try our patience. Yet, we can’t help rooting for Baek and his potential new family, because they all look so good together. So, to recap, if you need a sensitive hulk, Don Lee is your man. As good old Lincoln Hawk says: “The world meets nobody halfway. When you want something, you gotta take it.” To that end, Lee carries this film and thereby grabs leading man status. Nobody should have any illusions—Champion is shamelessly manipulative and sentimental, but it is an indomitable crowd pleaser—with distinctly Korean sensibilities. 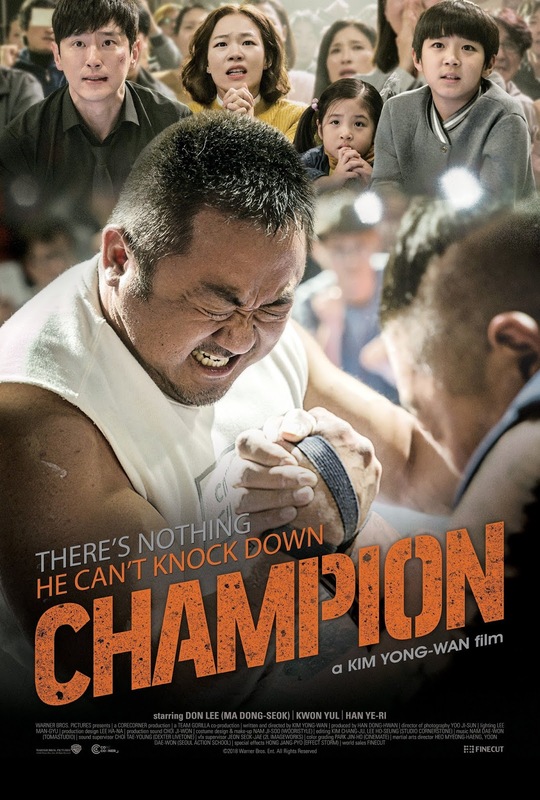 Recommended for fans of Don Lee and family-friendly triumph-over-adversity sports movies.